Big Moss Augusta 4'x12' Putting Green The Big Moss Augusta Putting Green is a 4' x 12' premium putting and chipping green. Perfect for home and office use, it offers unmatched versatility for teaching and year-round practice. It rolls like a freshly-cut bent grass putting green with a True-Roll downgrain built right in. It is completely portable and sets up in minutes without tools. Break Snakes? provide unlimited contours that you can create. Make putting fun and exciting, anywhere you go. Compete with family and friends of all ages and improve your game while enjoying yourself. The Big Moss Augusta Putting Green is available in 2 packages: 1. Standard Package: 4'x12' Putting Green, Chipping Mat, & 1 Break Snake 2. 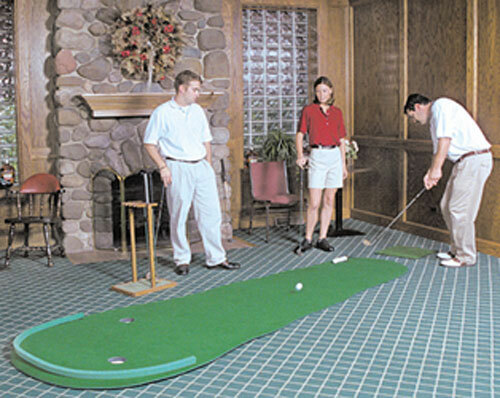 Ultimate Short Game System: 4'x12'' Putting Green, Oversized (36"x36") Chipping Mat If you have any questions about this product or would like to order by phone, please call us Toll Free at 888-733-8383. We look forward to hearing from you! The Big Moss Augusta Putting Green is a 4' x 12' premium putting and chipping green. Perfect for home and office use, it offers unmatched versatility for teaching and year-round practice. It rolls like a freshly-cut bent grass putting green with a True-Roll downgrain built right in. It is completely portable and sets up in minutes without tools. Break Snakes provide unlimited contours that you can create. Make putting fun and exciting, anywhere you go. Compete with family and friends of all ages and improve your game while enjoying yourself.